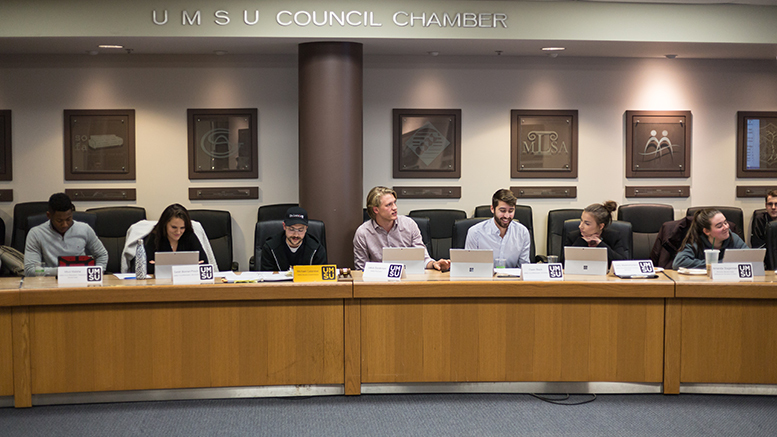 A motion to close off UMSU selections committee meetings from public scrutiny failed by only a few votes Thursday after members expressed concern the changes would create a less transparent union. The motion suggested selections committee meetings be held in closed session, making them inaccessible to members outside the committee “given the sensitivity of the items often discussed,” unless otherwise decided. The last selections committee meeting, held Jan. 28, included applications and decisions on appointments to one governance committee position, one judicial board representative position, two judicial board member-at-large positions and the appointment of several uncontested applicants to several committees. The board was initially to vote on a motion that would restructure multiple committees along with closing the selections committee process, but UMSU president Jakob Sanderson proposed to separate the clause specifically focused on closing selections committee meetings into a separate motion and for it to be voted on separately, which passed. The motion was brought forward shortly after the union fulfilled a request by the Manitoban to turn over a number of student union documents, including minutes from selection committee meetings and credit card and budgetary statements. The requests were initially denied by Sanderson, who argued UMSU’s governing documents barred their release. When it was discovered they were open information, UMSU provided them. A member of the Manitoban editorial board, comment editor Jacob Singleton, delivered a statement encouraging the board to vote down the motion. While Sanderson stood by the motion — referring to concerns that keeping selections committee meetings open would cause applicants for positions to fear their “individual attributes as people [were] going to be aired out for all members of the union to see” — he said he sees the reasoning behind keeping committee documents public to members. “All members of the selections committee are board members. I personally trust those board members to make excellent decisions with regard to the selections committee bar,” he said. The motion inspired discussion from the board and members at large. Student-at-large Mohamed Soussi, who was present at the meeting, said he opposed the selections committee being closed off. “I want to know who’s being picked for this committee, I want to know why they were picked, I want to know what makes them so special,” he told the board. “To say that a committee in parliament or any other government in place, especially a powerful one such as the selections committee, to say all of this will be hidden, will not be accessible by the general public, […] to me, I strongly disagree against that thought,” he said. UMSU vice-president student services Carly Mastromonaco said that while she does not “feel strongly one way or the other,” there was some concern among the executive after realizing selections committee proceedings were public information. “We almost felt a little bit uncomfortable, because there’s so much personal stuff that goes on in selections,” she said. Mbuli Matshe, vice-president finance and operations, stressed that whether or not the motion to close selections committee meetings passed, the committee will still be free to close any sessions by voting on it at the meeting. “Any [UMSU] committee or the board can go into closed session at any point,” he said. The motion eventually failed, including several abstentions from the board, but there is a possibility for the motion to be brought forward at a later date. UMSU chairperson Michael Catanese responded to a member asking if the motion could be amended and brought to the board again by saying it was possible, and members could even bring the same motion back again at the next UMSU board meeting.